Home for Good is a volunteer-based rescue, and none of what we accomplish would be possible if not for our dedicated team of volunteers. When you contribute your time and energy to us, you are directly saving lives. Whether your interests lie in bathing dogs, baking cookies for bake sales, processing applications or helping out at adoption events, our volunteer program has something for everyone. 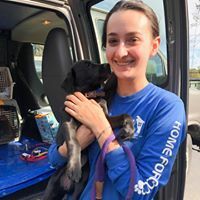 In addition to being a part of a team who gives dogs and puppies a second chance at life, when you volunteer for us you meet an array of amazing people (while having fun!). Any skill set that you have, be it dog-walking, fundraising or administrative , can help Home for Good save more lives. Contact us today to get involved!